Since ancient times, Mangystau has been a fertile land of nomads, an area that has preserved its secret secrets. The depths of it are rich in minerals, and the land is full of legends. The sacred land became the abode of 362 holy elders. There are belief that Mangystau is a land where "seven nations came and seven people left". Indeed, there are preserved a variety of cultural values of these seven peoples. There are different versions of the origin of the word Mangystau. The people are widely spread variants of "Myn auyl" or "Myn qystau" (Thousand villages or Thousand wintering grounds). The sacred history of Mangystau started back in the 14th century. At the junction of the Caspian coast and endless deserts stretches a harsh and mysterious land - the peninsula of Mangystau. At first glance, it may seem as though one is visiting dead desert, where the wind blows in the summer and dust storms rage. But the locals find this explanation: they say that these tortoises shake dust from their shells. Clinging to the bushes of the bus, we watched everything that flashed before our eyes, so as not to miss anything. Here each of us felt in the role of a merchant traveling the same caravan routes as our ancestors who crossed the Great Silk Road. Scientists call this region "the abode of fear." The founder of Kazakh mythology, Mangystau scientist Serikbol Kondybai believes the assumption of "fear" to be correct. In the East Turkic and Mongolian mythology "mangys" that means a dragon, a terrible monster. In the Mongols, he is an insidious, harmful, negative hero. In the Turks - he is a dual hero, having both positive and negative features. There are many assumption on the origin of the name of the region. First, the name of the edge comes from the phrase "myn qystau" (one thousand wintering). The second is related to the name of the Nogai tribe. Third, the word was formed by adding to the ancient Türkic word "men" - the four-year-old sheep of the ending "Qyshlaq". The fourth, according to the version of E.Koyshybaev, the word "Manghyshtaq" means "Mountain of monsters". In the foreword to the article, it is imperative to note about the etymology of the word "Mangystau", so that the reader would receive information about the origin of the name of the sacred land. The peninsula Mangystau - framed by a beautiful landscape of mountainous, desert terrain, bordering the gray Caspian, surrounded by the Bozashchy peninsula, is revered as a unique natural object. Earlier, oil and gas fields, the Caspian Sea, sacred places appeared in the mind. But, as it turned out, Mangystau can charm everyone with its amazing nature, layered canyons, deep history, bottomless wells, wandering sand dunes. The purpose of the visit of tourists to these holy places is to visit spiritual, historical places, underground mosques, left from their ancestors, to see with their own eyes the potential of spiritual modernization of the region. Many people start their trip to the region from the city of Aktau - the center of Mangystau. During a special visit paid by the historians of the National Digital History portal to the region, there was a great opportunity to visit many places in Mangystau. For instance, one of them was a museum. Mangystau State Historical and Cultural Reserve was founded in 1980. To date, more than 500 historical and cultural monuments have been taken under state protection. Most of them belong to archeological monuments, about 200 belong to architectural monuments. The list includes more than 13 thousand individual monuments. The main activities of the Reserve staff are archaeological excavations, protection, protection, record keeping, research work in the Mangystau peninsula and the Ustyurt plateau, the Bozashy peninsula in the southern part of the Caspian Sea. Annually, the staff of the institution carries out archaeological exploration. During the trips people visit settlements, check the monuments of that area, collect legends and parables, historical data on monuments. The purpose of this article is to draw on the most visited and historic places of Mangystau - Beket ata mosque and Ustyurt Plateau. Firstly, let us have a look at the former - underground mosque Beket Ata. A place where history is intertwined with legends. In 1750, a wonderful boy named Beket Ata was born near the village of Kulsary in the Atyrau region. When he was 14 years old, he went on a pilgrimage to pay homage to the ashes of the revered sage Shopan Ata, and received from him a blessing to comprehend knowledge. This is how the history of the Beket Ata mosque begins. Beket Ata's earthly path was not simple, but it was certainly incredibly rich and fruitful. During his lifetime he became famous as a healer, a clairvoyant and a man who knows the laws of mathematics, physics and astronomy, and also as a wise man, capable of resolving any dispute and leading the warring parties to peace. Returning in his adult years to his native land, he built here several mosques, one of which - carved into a rocky promontory in the Oglandy tract - became the site of his last refuge. It was during the underground mosque in the Oglandy tract that Beket Ata, who became a Sufi and began to teach children, founded a Sufi school. Subsequently, according to archaeologists, the mosque even became a kind of scientific center and observatory. And, of course, for several centuries now, numerous pilgrims have flocked to the mosque to worship Beket-Ata and ask for his intercession. And knowledgeable people say that he never leaves those who genuinely ask for help. A tradition - and even an unwritten rule - was the visit of pilgrims to the mosque of Shopan-Ata, located on the way to the underground mosque of Beket Ata. Deciding to go to the underground mosque of Beket Ata, remember that this place is a religious shrine for a large number of people, and therefore it is extremely important to observe the rules of its visit. The winged expression "In Medina there is Muhammad, in Turkestan - Khoja Ahmed, in Mangystau - Saint Beket" - a testament to the prophetic glory of Beket Ata. This saying is written on the billboard at the entrance to the Beket-Ata complex. After reading the prayer at the mausoleum of Oglandy ata, we headed to the Beket Ata complex. The mosque, built by Beket Ata himself by the end of his life, is 180 kilometers south-west of the city of Zhanaozen of the Karakiya district of Mangystau region, 90 kilometers northeast of the village of Senek. The mosque was cut down in the middle tier of a high cliff, in the thickness of the cretaceous rocks of limestone remains. Only in the morning we went to inspect the underground mosque. One of the honored people in Western Kazakhstan is Beket Ata Myrzagululy. As a Sufi dressed in sackcloth, he chose for prime hermitages a pristine desert land forgotten by God and people - Mangyshlak peninsula. Master builder Becket-ata built four mosques on the rocky spurs. The first in Kulsary - it is called Ak-mosque, the second in the chalk rocks 20 km from the village of Beineu, the third - in the area of ​​Tobykty and the fourth underground mosque cut down in an array of Cretaceous rocky cape in the tract. When he came to bow to the ashes of the revered sage Shopan Ata, he received his blessing and the order to learn. In madrasah of distant Khiva, he comprehended science. Having reached the age of fourty, he became a Sufi, began to teach children literacy. He healed people: he was visited by the infirm and suffering, he gave them health and vitality. When resolving disputes, he showed wisdom, which led both sides to an agreement. In his sermons, Becket-Ata instructed believers to be just and do good. The sage and saint remained in the memory of the people and as a warrior who performed feats in battle with the Kalmyks. He possessed heroic strength and boldness, like his great-grandfather - Eset Batyr. With the blessing of the holy spirit, good deeds multiply. The Sufi Beket Ata does not leave those who turn to him for help in trouble. Beket-feast was remembered in the memory of the people and as a prophet, a prophet, to whom the Book of Being is open. Underground mosque Beket Ata in the area of ​​Oglandy, which became its last refuge, despite its inaccessibility, is a place of mass pilgrimage. They say that after visiting the grave of this saint and the mosque with the believers, healings occur. Others say that the rooms carved into the rock of the mosque exactly repeat the arrangement of the rooms of the pyramid of Cheops. According to experts, this extraordinary similarity is attributed to the fact that the symbolism of Sufism adopted many mystical symbols of antiquity, including Egyptian priests. Beket-Ata is a spiritual, historical and architectural monument. The extraordinary acoustics of the underground mosque is striking - in all rooms the surprising audibility of the prayers read. Moreover, with open doors, air vents there is no draft. It seems that the Sufi really intuitively comprehended the laws of science. Scientists put forward a bold hypothesis that the Beckett-Ata mosque was a similitude of the observatory in which the saint watched the motion of celestial bodies. This allowed him to accurately predict the harsh winter, hot heat, showers, determine the time of migrations to jailau. At the top of the Oglandy tract is a house of pilgrims, also called a "house with blue domes". Many legends can be heard in this house about the miraculous abilities of Beket. The land of legends, the place of miracles and cosmic landscapes, the shelter of rare fauna representatives, the abode of many saints is our peninsula. On the one hand, this desert steppe, on the other - the land, saturated with beautiful islands of nature, ancient structures with centuries of history and ancient riddles. The most famous such a natural place, perhaps, is on the plateau of Ustyurt, which once lived unforgettable Beket ata. It took two centuries, as this legendary man settled in the bosom of a virgin nature, conducted enlightenment activities, practiced medicine, possessing supernatural abilities. But the memory of him is alive to this day and with time is even stronger in the minds of his descendants. Therefore, thousands of pilgrims strive to where the air itself is imbued with mystery and holiness, where the sacred spirit rules over worldly vanity. About the holy and pilgrimage to the place where he lived and was buried, almost all the inhabitants of Mangystau and beyond heard it. Many who have visited here, talk about the phenomenon: if a person sincerely believed and prayed to the preacher, he, as a rule, responded to the plea. The path here is not easy, but Beckett himself said that the road to it is difficult, but who will overcome it, he truly believes. This is confirmed by thousands of pilgrims who are striving in these mysterious lands. Among them, not only our compatriots - many visitors from near and far abroad, which testifies to the far-reaching glory of an unusual place. Tradition says that the magician was very fond of animals, and therefore they fearlessly surrounded him. Since then, even today, you can see gazelles, foxes, hares, arhars, saigas, outlandish feathered kingdom. Moreover, you do not believe your eyes when, for example, a fox and an archar walk side by side. Animals are not afraid of people, walk along the sidewalks, feeling the patronage of the former master. The invisible presence of the sage, to whom the book of existence was opened, is felt in everything: in every pebble, in a tiny blade of grass, in the graceful carriage of a ghazal that has frozen on a rocky ledge. A steep descent to the dwelling of a sage, barely noticeable trails, which already contain invisible traces of his feet, mountainous slopes, along which climbing animals, hovering in the sky unprecedented birds - all this produces a grandiose impression that can not be described in words. An enthusiastic palette of feelings embraces a traveler who has set foot on the earth, filled with a divine beginning, sublime above the usual things. Good mood and peace remain for a long time after leaving the reserved territory. Finally it is important to focus on how to behave in such unusual places. People who come here for the first time often often have no idea about the established rules for visiting such complexes. It's good, if a traveling wanderer interviews those who have already visited here, and follow all the necessary recommendations. Going on the road, not for a minute should you forget about where you're going and for what purpose. First, do not make such a trip just as a tourist - it's a reserved place, where spirituality comes to the fore. To come here from interest is an empty matter, for this old Beket can punish. A person must mature, get conscious, gain a firm conviction that he needs to overcome a difficult road in order to mentally meet with a saint and tell that to his secret secrets. Faith is the main thing. Simple curiosity here is inappropriate and even blasphemous. Inadmissible frivolous behavior, squabbles, profanity, especially the use of alcohol. For such sins will inevitably be punished. Many people who want to come here the road opens not immediately, or even completely closed: a person is repeatedly going on a trip, but every time it is kept by circumstances. Hence, the time has not yet come to meet the preacher or the thoughts are directed to a different direction, unacceptable in this case. It is also important to mention the staff that Beket ata received from his teacher who was from Khorezm. This priceless relic is kept in the house of Berdijan Ayapbergenuly - the descendant of Beket ata in the seventh generation. Before you look at the staff you need to sincerely believe in its strength, and according to the Muslim custom it is necessary to perform ablution. Ask any person in the village of Batyr, Munayly district, Mangystau region, they will show you the way without hesitation. Because this house has a special aura that soothes and pacifies a person. The descendant of Saint Becket says that their grandfathers wore a staff on their backs. In the Khiva Khanate was the Sherkala Mosque. All the representatives of art and science gathered in it. The Turkmen poet Maktumkuly was trained in this mosque. Becket ata also studied here. They learned from Pakirzhan Haji. One day Haji said: "Someday I will give my staff, and I will give my blessing (bata) to that person." The disciples began to argue, each hoping to get a staff and a blessing. After finding no alternative, Haji threw his staff and said: "To anyone who finds and brings a staff, I will give my blessing (bata). The staff landed in the Akkoltyk area in the Mangystau region. Mangystau is a special place created by the command of Allah. Here, to pass the test, sent the saints (Aulie). For example, from a distance here came Sholpan Ata and Shaqpaq Ata. After graduation, Beckett returned to his native land, built a mosque, taught children, called on the people to learn. It should be noted that Saint Becket had four important qualities: firstly, he was a batyr, actively participated in the struggle against the enemies of his people; Secondly, he was an educator, he passed the thorny path of science, he was engaged in the education of children; Thirdly, he is an architect who built buildings for mosques and madrassas; fourthly, a gifted man who held out a helping hand to the needy and sick, he was also a visionary who predicted important events. The place is a mystery - the Ustyurt plateau is located between the Mangyshlyk peninsula and the Kora-Bagaz-Gol in the west, and the Aral Sea and the Amudarya delta in the east. The huge elevated plain has an area of ​​about 200,000 square meters. km. And though the highest points of the plateau do not exceed 350 meters, nevertheless, on the surrounding terrain Ustyurt looks like a sharply outlined object, thanks to the Ustyurt Plateau. Historical reserve Ustyurt, archaeological monuments of antiquity, abrupt slopes - chinks, which rise by sheer walls to a height of 200-300 meters. The broken line encompasses the entire territory of Ustyurt, emphasizing its geographical boundaries. The nature of the plateau is original and unique, there are no such "cosmic" landscapes anywhere else. Within a few days the traveler sees in front of him only a flat horizon, and a smooth surface like a table. And only sometimes the plain is plowed by small saucer-shaped depressions, more recognizable, by a change of vegetation, than visible visually. The nature of the soil and vegetation of the Ustyurt plateau show that the plateau is a desert, partly rocky, thanks to the Sarmatian limestones, partly clayey from surface-forming suspensions and loams. Underground waters and desert weathering have a huge influence on the formation of the modern relief. Going to the surface in the form of springs, they form the famous chinks, contributing to the slipping down of the often huge blocks and eating off the Ustyurt plateau all the new and new territories. But not only natural beauty attracts fearless travelers. The Ustyurt plateau is amazing and up to the insulting little-known place, although for centuries the plateau has been a crossroads of civilizations. Although today the plateau is almost deserted, in ancient times people used it very intensively, and its history remembers and carefully preserves traces of the presence of Scythians, Mongols and even earlier peoples. The main sights of the Ustyurt plateau are archaeological sites of antiquity. More than 60 Neolithic sites have been found on the plateau. In the Middle Ages, through the Ustyurt plateau, there were numerous caravan routes, such as the road connecting Khiva with the lower reaches of the Volga and Emba. It was along this caravan route that the ancient city of Sharh-i-Wazir, the caravan-shed of Beleuli and the fortress of Allan were located. Throughout the plateau, ancient necropolises and places of worship are scattered, here are the ancient Sarmatian burials of the ancient nomads, and the majestic mausoleum-mausoleums of the Islamic period, and the so-called "arrows" standing apart. The wonders of Ustyurt are poorly studied ancient structures. Almost all of them are very similar and represent a base in the form of a bag, from which two arrows diverge with pronounced tips. Arrows are limited by low curbs along the entire length from both sides in the direction to the tips - pits up to 2 meters deep. It is very similar to the conventional symbols of the map of military operations of the Great Patriotic War. Scientists still do not have a common opinion about the use of structures. There are hypotheses that arrows served for mass seasonal hunting for ungulates or for collecting water. Although Ufologists, relying on the fact that the "arrows" are clearly visible from the height and almost invisible on the ground, argue that these structures are a complex and represent an ancient cosmodrome, the same as in the Peruvian desert Nazca. Forty years ago, at the foot of the eastern chink of Ustyurt splashed a huge lake Sudochye or Sudushy (as the locals call it, which means "fresh water"). It was the largest internal reservoir of the Amudarya delta and occupied an area of ​​350 square kilometers. But in the late 60's, when water from the river began to be taken for irrigation, the lake quickly became shallower and disintegrated into four parts: Akushpu, Karatereng, Begdulla-Aydin and Bolshoye Sudochye. Today, there is no Akushpa already, it is dry and only winds are frequent guests, twist light tornadoes from salt and fine sand at the bottom of a dried up pond. Almost nothing remained from the rest of the lakes, but if you look closely, you can see that here and there migrating birds flock to the shallows, for them Sudoche has always been a place of rest on the way of seasonal migrations. A couple of years and birds will have to change the route. Several kilometers along the shore of the once flourishing fishing cooperative. In this I can not believe, but once here they caught fish and transported it along the channel linking the lake with Aral to Muynak at the fish factory. The sea is gone, the village is dead. In 1971, these places were left by the last inhabitants. So there were the orphaned ruins, and the unhappy Christian cemetery, who settled here for a long time from the old believers. One of the most unexplored and mysterious and at the same time the most beautiful places on the planet, the plateau of Ustyurt, is still terra incognita, even for experienced tourists. The expedition to this amazing region we started to prepare for the year, trying to provide for any possible problems on the road, and finally our long-awaited journey took place. It is a vast desert stretched by a wide strip between the peninsula Mangyshlak and the eastern shore of the Caspian Sea on the one hand and the Aral Sea and the Kara-Kum and Kyzyl-Kum deserts on the other. Rising above the plain, in some places it breaks off to the surrounding plain by steep, inaccessible ledges - chinks. The colors of the chinks amaze with their elegance - from pale pink to dazzling white. During the sunset, the plateau transforms and creates an amazing picture of nature, white chalky rocks are painted in a crimson color. The highest south-western part of the plateau is called Bozzhira and represents separate ridges resembling small mountain ranges. To say that this place is beautiful is not to say anything. The people who travel half the world and visited, it would seem, in the wildest and most lost land corners, was struck by the bewitching beauty of these unearthly landscapes. It's a shame that Bozhir and Ustyurt undeservedly deprived of the attention of tourists and travelers. Although, perhaps, thanks to this particular place, it preserved its virgin primordiality? From the point of view of geology and history of origin, the plateau of Ustyurt is the bottom of the ancient ocean, which existed in this place, gradually drying out, more than fifty million years ago. The land here is everywhere dotted with breaks and cracks, and the landscape bordering the stony plateau of cliffs (chinks) up to 350 meters high makes you feel like a pioneer of planets from some fantastic blockbuster. Or as if using a time machine takes you a couple of million years ago. Local residents talk about Ustyurt: "This desert is so empty that you can not even meet an enemy here." And this is not surprising, because you can climb the plateau in only a few places. There are no vegetation, water reservoirs and permanent rivers, and the climate is so severe that it is almost impossible to permanently live in this desert: in winter the air temperature drops to - 40° C, whereas during the summer sometimes it reaches + 60° C. Because of such a climate, complete lack of water and remoteness from modern roads, Ustyurt even today is much worse than the famous Karakum. Its vast area of ​​about 200,000 km² until the 80s of the last century was a kind of archaeological reserve, a solid "white spot". The more interesting it was for us to test ourselves! In addition to the desire to see these unreal landscapes, the main goal of any tourist is to survey the famous Ustyurt. There is a scarce knowledge on the giant images similar to the drawings in the Nazca desert, discovered on a lifeless plateau three decades ago, and it is only known amongst a few scientists; and it's worth the help of the state, and Kazakhstan may have its own center of gravity for lovers of extreme tourism from around the world. These mysterious "arrows" discovered quite by accident. In the 80s, an aerial survey of the plateau was carried out to compose a topographic map of the area. And while studying one of the districts of Ustyurt, the cartographers found some strange lines on the pictures, obviously of artificial origin. The lines were formed into sweeps of enormous length, directed "points" to the north. The tips of these "arrows" have round holes in the corners of the lines, and the arrow itself is formed by stone shafts that are half destroyed by time. The height of the shafts is now slightly less than a meter, but judging by the stones scattered around them, they were much higher before. Most of all, the scheme of "Ustyurt wonders" resembles a giant military map, on which the direction of the attacks of troops is indicated by bold arrows. Cyclopean system of "arrows" could be traced to hundreds of kilometers. On its scale, it surpasses the much more well-known system of lines and drawings in the Peruvian desert of Nazca - the only comparable in scope analogue. Just like in other spot, arrows can only be seen from a bird's eye view. What were they created for? Scientists have not reached a consensus yet. According to one version, the system of "arrows" served to drain water, which was sent to "arrowheads" - a kind of reservoir. In another, these "arrows" had a sacral significance. Long before their discovery, a whole complex of archaeological monuments was found near them: burial mounds, burials, religious buildings. The latest ones date back to the 10th and 15th centuries, but most are undoubtedly much older. Today, on the peninsula of Mangyshlak and the Ustyurt plateau, more than a thousand architectural monuments have been discovered: underground and above-ground temples carved right in the rock, huge necropolises-cities of the dead. In any case, the complex of these lines is completely unique - nothing like this happened before in Eurasia. Not far from the "arrows", scientists discovered stone figures of animals resembling giant turtles looking to the northeast, as well as many small pyramids of rough stone resembling Egyptian pyramids. Concerning flora and fauna, it should be noted that there is nothing that could surprise a tourist. Dominated by such representatives of the plant world as wormwood and saxaul. In a more favorable spring period, which does not last long, flowers appear, and the picture becomes brighter. The animal world is more diverse. There are all those species that have adapted to life in the steppes and deserts. Climatic conditions on the plateau favor reptiles, which are represented by lizards, snakes and turtles. Well settled small rodents (jerboa, ground squirrel, marmot, gerbil), hedgehogs and hares. This is despite the fact that each of them is a potential prey for the wolf, fox or caracal. The cheetah, which belongs to rare species, is not bad, therefore we are guarding the law. The pride of Ustyurt is considered to be fearful saigas. Unfortunately, their population is in critical condition. Having visited the plateau, one would definitely feel as if he/she went back tothe history. Much to this day remains a mystery, the discoveries of the researchers are only conjectures. Runic letters on the rocks, necropolis in the cave, architectural monuments, underground and above-ground temples. In the interest of the study, aerial photography was conducted here. A great sensation was discovered stone sculptures of an unknown civilization, as archaeologists noted, nothing like this was found in the steppes of Eurasia. According to their assumptions, on the Ustyurt plateau along this road there were fortresses, caravanserais, settlements of artisans, cattlemen and hunters. In the 1st millennium BC. On the lands of Mangystau passed the Great Silk Road from Khorezm and Khiva to Europe and the Middle East; but stone sculptures had nothing to do with this. These findings testified that in the fortresses and in these settlements there was a fairly high standard of living, but for now these questions remain a great mystery, timeless. 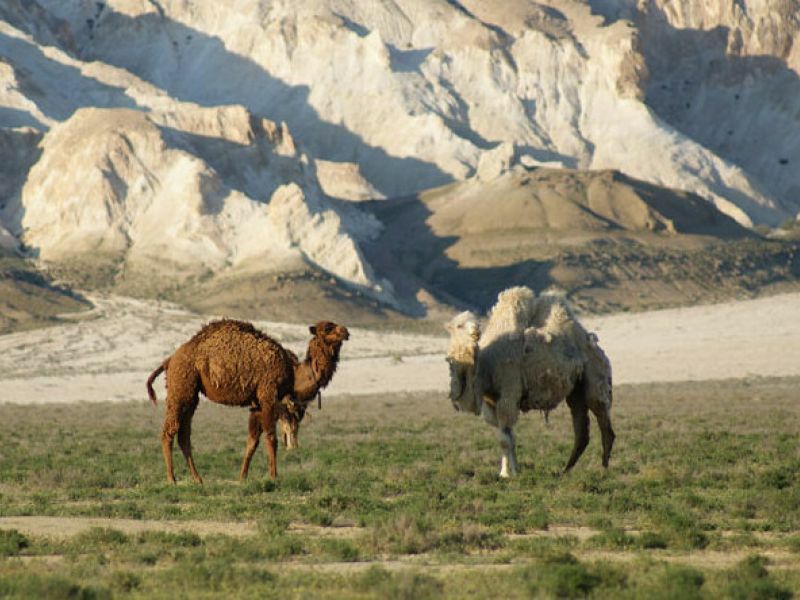 Currently, the Ustyurt plateau attracts a lot of attention of tourists and lovers of traveling. Between the stone slabs work was carried out to expand the road, a long descent along the plateau only confirms the opinion of scientists that about 50 million years ago this place was the bottom of the Tethys ocean. Not far from the plateau there are small agricultural auls, along the road you could see a lake with a stone bottom, which contributed to the accumulation and storage of rain water in it. This place became a watering place for a lot of camels. Mystic sites on the peninsula of Mangystau are many, one of the largest and to the end not yet studied to date is Ustyurt. By the way, there is a bold opinion that this whole stone complex, built by unknown builders from antiquity, is nothing more than a cosmodrome. Whether or not science can not prove it, but even today, inexplicable phenomena often occur on the Ustyurt plateau, such as bright glows in the sky, day and night mirages that have been observed by local residents and amateurs of all mysterious and inexplicable.